White jeans are to a man’s wardrobe what Donald Trump is to the American electorate: no not a shouting scotch egg, but something that’s hard to miss and nothing if not completely polarising. Despite their ability to split opinion like few other items in a man’s wardrobe, like clockwork they resurface and multiply each spring/summer season, and are worn often with wildly varying degrees of success. So for those who want to try the pale stuff on for size, how do you tackle this notoriously tricky trend? To ensure you don’t look like a middle-aged mum abroad, take note of these seven rules for nailing wearing white jeans, and silence the naysayers like a sartorially accomplished pro in the process. Like its monochromatic brother, black, white is a killer summer colour (okay, it’s not technically a ‘colour’, but we haven’t the time for a science lesson) to contrast stronger shades against. As such, try wearing white jeans with every man’s favourite dark hue – navy blue – for a sophisticated look that taps into the nautical look without going overboard. The most redeeming feature of colour-blocking in this way is that it draws the eye upward, which, if your legs are on the shorter, stockier side, helps elongate your frame and make you appear taller. There’s a fair chance you spent the cooler months wearing black from head to toe. 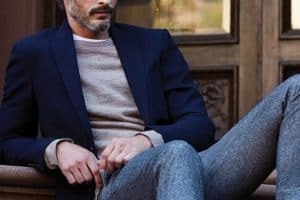 And rightly so – the tonal dressing trend is going nowhere, and it’s a reliable option for guys who like to look sharp without having to think too hard. Fortunately, the same thing goes for wearing all-white. Wear white jeans with a plain white T-shirt or collarless shirt and a pair of minimal sneaker for an outfit that’s fresher than a pillow with a mint on it. Some words of warning: if white steers a little too close to your skin tone, venture off-white until you’ve reached a hue that provides some contrast, or risk looking like a walking tube sock. Wedding season is upon us, which presents a variety of sartorial options to choose from. If it’s a formal occasion, then your sharpest lightweight summer suit is obviously the way to go. However, if the nuptials are a decidedly more laid-back affair, there’s scope to have some fun and experiment by smartening up your casualwear. To this end, white jeans can be upgraded easily with the addition of an unlined linen blazer and a chambray shirt. Plus, it’s a look that subtly marks you out as the best-dressed person in white, even above the bride. Just keep the rest of the outfit in check with details such as a knitted rather than traditional silk tie. Wearing a pair of bright white jeans is a statement in itself, which means there’s little-to-no room for messing about with a pair of stark trainers. To avoid looking like your legs are melting into the ground, look to combine white jeans with a pair of minimal black sneakers or rich brown loafers for a more sophisticated look on firm footing. Alternatively, opt for a pair of brown chukka boots or, at the very most, some blue deck shoes if you’re a fan of Riviera style. It takes a brave man to pull on a pair of white jeans in public (but arguably an even braver one to pull them off.) Of course, it’s a task made easier by knowing they’re highlighting your best bits. Bright leg coverers have a nasty reputation for exacerbating the appearance of chunky thighs and legs. But for those with a lean build, the flattering way to wear your whites is in a smart slim- or skinny-fit with a minimal break. If you try a pair that’s too long or baggy, you’ll quickly notice how sloppy all that bunched up, pooling fabrics looks, so – more than ever – pay careful attention to how they fit you. 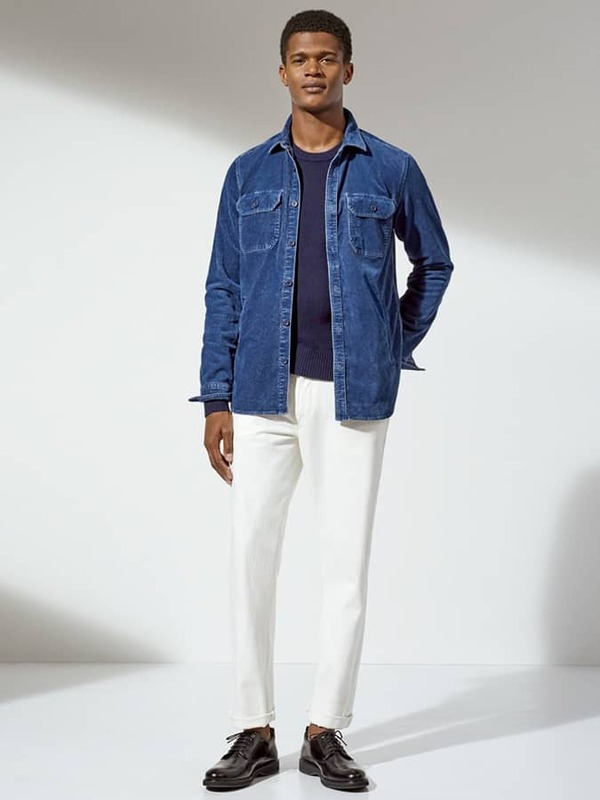 White jeans may be considered ‘out there’ among the canon of men’s staples, but just like black jeans, they’re neutral ground technically speaking, which means they’ll team up nicely with print up top. If you worship at the altar of minimalism, a short sleeve shirt with a dark base and lighter geometric or floral print is a safe place to start. But, if you’re looking to give your Day-Glo white denim a more tropical twist, opt for a botanical print shirt with a green, blue or red base. White sneakers (sans sock, of course), black penny loafers, buckle strap sandals or tan suede Chelsea boots can all be worn with this pairing, so there’s a footwear finishing move for every ilk of man. Few things are so deserving of the title menswear icon than the field jacket, which has genuinely earnt its moniker thanks to its timeless and seasonless appeal. Though it’s a safe bet in winter, the classic green field jacket comes into its own in the warmer months when paired with white jeans, and if you need further proof, just ask the men of Pitti Uomo. To give this perennially cool combo a bit of contemporary swag, slip into a pair of retro runner sneakers which will add just enough interest without downgrading the look’s icon status. The Best Quartz Watches For Men 2019 They're cheaper and more accurate than a mechanical... The Man’s Guide To Testosterone Everything you need to know about the most important hormone in your body (including whether you *really* need to boost it) The Insider's Guide To Sneaker Reselling Are you sitting on a pair worth thousands?